Amazing Love Ministries was founded by God through Barbara and Jim Killeen in 2005. 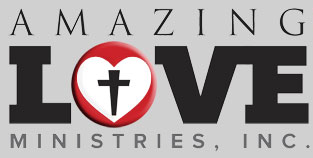 The main purpose of Amazing Love Ministries is to show God’s love and to bring the good news of Jesus to the lost. The ministry started as a ministry to serve the homeless people on the streets of Tampa at Curtis Hixon Park. After 2 1/2 years at the park the ministry moved to the parking lot at Hyde Park United Methodist Church for 2 ½ years. God opened doors then for the ministry to move into the United Methodist Church building on 17th street. God again opened doors for the ministry to obtain its’ own building at 3304 E. Columbus Dr. through the generosity of a special person who heard and obeyed God’s call. The ministry now serves not only the homeless people but also the less fortunate in the community where it serves. The ministry provides food, clothing, linens, shoes, backpacks, blankets etc. to anyone who comes to the ministry in need. Showers are now available at the ministry due to the generosity of Van Dyke Church in Lutz. The ministry serves anywhere from 150-200 people a hot meal on Monday nights at 7:00 PM courtesy of many volunteers from various churches in the Tampa Bay area. The meal is followed by a worship service. The ministry is open on Monday, Wednesday, and Thursday from 1:00 PM -8:00 PM with Bible study on Wednesday at 6:30 PM and Amazing Life Support groups on Thursday at 6:30 PM. Sunday services are at 10:30 AM followed by breakfast.